This morning’s assessment continues to show no change with of any of the down slope flow areas. Surface breakouts and breakouts along both margins upslope of the flow front continue and provide indication that the tube system continues to be supplied and lava from the source is making its way to the down slope areas. The breakout along the north margin remains active however sluggish and widening and no advancement was noted since yesterday morning. The leading edge of this breakout is approximately 1 mile to the west or mauka of Highway 130. Due to low cloud cover and poor weather conditions an assessment of the summit area and upper slope activity was not possible. All current activity does not pose an immediate threat to area communities. The Hawaii County Civil Defense Agency and Hawaiian Volcano Observatory are maintaining close observations of the flow and residents and businesses down slope will be informed of any changes in flow activity and advancement. Smoke conditions were light with a light north wind blowing the smoke in a southeast direction. Smoke conditions may increase in some areas and individuals who may be sensitive or have respiratory problems are advised to take necessary precautions and to remain indoors. A light rain was occurring this morning and there is currently no brush fire threat to area communities. On behalf of the Hawaii County Civil Defense Agency and our partners we would like to thank everyone for your assistance and cooperation. Activity Summary: Kīlauea Volcano continues to erupt at its summit and from its East Rift Zone. The inactive distal tip of the June 27th lava flow remains roughly 500 m (~550 yd) from Highway 130 in the area west of the Pāhoa Fire and Police Stations. Breakouts continue in both the down slope and up slope flow areas. The breakout along the north margin of the stalled flow tip is still active but sluggish, and has not advanced since yesterday morning. The leading edge of this flow is approximately 1.6 km (1 mile) up slope of Highway 130. Activity continues along the new breakout that started from the upper June 27th tube on the north flank of Puʻu ʻŌʻō. Tiltmeters located at the summit have recorded deflationary tilt since yesterday evening. 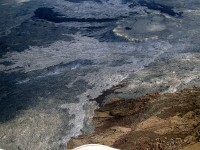 June 27th Lava Flow Observations: During yesterday’s overflight, HVO staff observed that the inactive flow tip remains stalled with scattered breakouts active about 0.45 to 2.7 km (0.3-1.7 mi) up slope of the stalled flow tip. The lobe extending to the north, about 1.6 km (1 mi) up slope from Hwy 130, hosts the most vigorous activity, and has advanced 300 m since February 19. While the flow continues to widen, no advancement has been observed over the past 2 days. The lobe on the south side of the flow, about 870 m (0.5 mi) up slope of Malama Market, is no longer advancing, but hosts a few active breakouts several hundred meters upslope of the stalled front. Activity continues on the new breakout that started from the upper June 27th tube on the north flank of Puʻu ʻŌʻō. 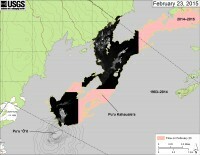 The breakout about 3 km (2 miles) northeast of Puʻu ʻŌʻō at the forest boundary remains active. Scattered activity also continues west of Kaohe Homesteads in the same general areas that have been active for about the last month, as well as in a slightly down slope area. Observers on a Civil Defense overflight this morning reported no change in any of the down slope flow areas. Puʻu ʻŌʻō Observations: The tiltmeter on the north flank of Puʻu ʻŌʻō shows deflationary tilt over the past day. Webcam views show incandescence in the normal locations within the crater. A new pad of lava on the northeast edge of the crater floor, and 2 small lava ponds in areas of normal incandescence were observed during yesterday’s overflight. Seismic tremor has remained low. The rate of sulfur dioxide emission from all East Rift Zone vents was about 200 tonnes per day, measured on January 7 (unfavorable wind and weather conditions have prevented more recent measurements). Summit Observations: Tiltmeters operating around the summit have recorded deflationary tilt since yesterday evening. The level of lava within the summit eruptive vent dropped slightly over the past day and is estimated at roughly 50 m (165 ft) below the rim of the Overlook crater this morning. Emission rates of sulfur dioxide were measured at 3,300 tonnes/day on February 13. In the summit caldera, a small swarm of long period earthquakes began after the onset of summit deflation yesterday evening. These earthquakes are located about 10 km (6 mi) deep with a maximum magnitude of 2.3. This map overlays a georegistered mosaic of thermal images collected during a helicopter overflight of the distal part of Kīlauea’s active East Rift Zone lava flow on February 23 at about 12:30 PM. The base image is a satellite image acquired in March 2014 (provided by Digital Globe). The perimeter of the flow at that time is outlined in yellow. Temperature in the thermal image is displayed as gray-scale values, with the brightest pixels indicating the hottest areas (white shows active breakouts). The blue lines show steepest-descent paths calculated from a 1983 digital elevation model (DEM; for calculation details, see http://pubs.usgs.gov/of/2007/1264/). Steepest-descent path analysis is based on the assumption that the DEM perfectly represents the earth’s surface. DEMs, however, are not perfect, so the blue lines on this map can be used to infer only approximate flow paths. 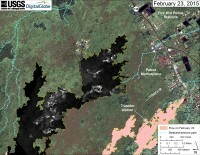 This large-scale map uses a satellite image acquired in March 2014 (provided by Digital Globe) as a base to show the area around the front of Kīlauea’s active East Rift Zone lava flow. The area of the flow on February 19 is shown in pink, while widening and advancement of the flow as of February 23 is shown in red. The blue lines show steepest-descent paths calculated from a 1983 digital elevation model (DEM; for calculation details, see http://pubs.usgs.gov/of/2007/1264/). Steepest-descent path analysis is based on the assumption that the DEM perfectly represents the earth’s surface. DEMs, however, are not perfect, so the blue lines on this map can be used to infer only approximate flow paths. This map overlays a georegistered mosaic of thermal images collected during a helicopter overflight of Kīlauea’s active East Rift Zone lava flow near Puʻu ʻŌʻō on February 23 at about 12:00 PM. The perimeter of the flow at that time is outlined in yellow. Temperature in the thermal image is displayed as gray-scale values, with the brightest pixels indicating the hottest areas (white shows active breakouts). Hawaii County Civil Defense Administrator Darryl Oliveira announced the regularly scheduled Pahoa lava flow community update meetings are being suspended until further notice. Chief Oliveira thanked residents for their understanding and cooperation, and said the county will resume the community meetings when additional briefings are necessary to keep the public informed. For the latest Civil Defense message, go to www.hawaiicounty.gov/active-al…. For more information, contact Hawai‘i County Civil Defense at (808) 935-0031. The Mayor has signed his Third Emergency Supplementary Proclamation, due to the threat of disaster due to the June 27th lava flow in the District of Puna, effective January 30, 2015. And that the Proclamation of September 4, 2014, Supplementary Proclamation of October 16, 2014 and Second Supplementary Proclamation of December 3, 2014 shall remain in full force and effect. 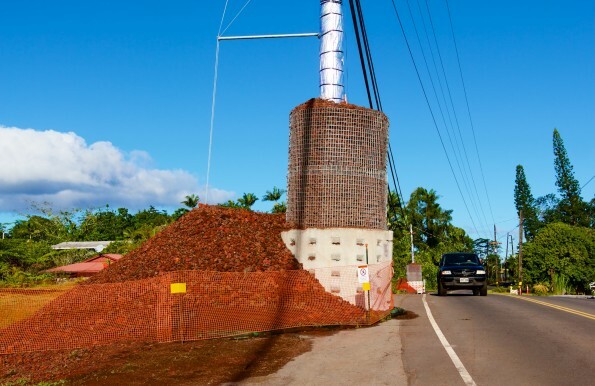 Work began Monday, Feb. 2 to clear more than 1 ton of lava from the Pahoa transfer station. Crews estimate about 800 cubic yards needs to be chipped off the transfer station asphalt and carted off in 40 truck loads. Workers also will reinstall a water tank, reconnect electricity and complete other repairs before the transfer station reopens in March, County Environmental Management Director Bobby Jean Leithead Todd said. The Kilauea June 27th lava flow dribbled through a chain link fence and prompted the closure of the transfer station to close in October. Reopening the transfer station is estimated to cost approximately $100,000, Leithead Todd said. Some of the rock will remain on site to be used for landscape and rock wall features, she said. In addition, the lava that flowed down the grass embankment does not impact the transfer station operations and will not be removed. Meanwhile, public access to area to view the lava flow closed Jan. 31. The State of Hawaii Department of Health is currently operating three (3) air monitoring stations in the Pahoa and Leilani estates area in response to the current and ongoing eruption and lava flow activities. These monitiors detect the presence of air borne particles that may result from the burning materials (vegetation , grass, brush, and other materials). The data and information being collected by these monitors can be viewed at the following web site: emdweb.doh.hawaii.gov/air-qual… , click on “Quick Look” then go to “Puna Special Sites”. While the Kilauea lava flow advances, the Pahoa Public & School Library will remain open as long as conditions remain safe, announced State Librarian Richard Burns. The Library, located on the campus of Pahoa High and Intermediate School, provides materials, reference services, programs, public computers and free wireless Internet access to the Pahoa community as well as the public, charter, and private schools in the area. During this critical time, the Library will offer free after hours Wi-Fi service that will be accessible 24/7 as far as the signal extends beyond the perimeter of the building. In addition, Mountain View Public and School Library and Keaau Public and School Library will also offer this free Wi-Fi access for area residents. Wi-Fi users are advised to connect to the “HSPLS-Lava” network. As the lava flow crosses through the town, the Library may temporarily close due to poor air quality conditions, but it is expected to reopen once conditions are safe. “In an effort to provide access to the resources our Puna neighbors need, we are extending the hours of our free Wi-Fi service so that they can access the Internet for information, communication, recovery resources and other necessities” said Burns. The Pahoa Public & School Library is located at 15-3070 Pahoa-Kalapana Road. Public service hours are: Monday from 1 p.m. to 8 p.m.; Tuesday, Wednesday, Thursday, and Friday from 9 a.m. to 5 p.m.; Saturday and Sunday closed. Visit the Library or our HSPLS website: www.librarieshawaii.org for more information. Hawaii Electric Light is closely monitoring the progress of the Kilauea lava flow. There is no immediate threat to its facilities or power lines. The company continues to work with Hawaii County Civil Defense and other agencies to monitor and evaluate the flow and is prepared to respond. Because of the unpredictable nature of the flow, Hawaii Electric Light has developed several plans to keep the power on and will put into action the plan that best fits the situation. The safety of employees and community is always the top priority. Crews have started work on Government Beach Road. In addition, pole protection prototypes were built in the Puna area. In addition, Hawaii Electric Light is exploring the possibility of operating a micro-grid in the event the lava flow isolates lower Puna from the power system. However, outages may occur despite efforts to keep the power on for as long as possible. As the flow gets closer to our facilities, we will provide more specific information as to how customers could be impacted. Hawaii Electric Light’s free “Handbook for Emergency Preparedness” provides detailed information on preparing for emergency situations. The handbook is available in English, Cantonese, Ilocano, Korean, and Vietnamese and can be found at the company’s business offices, on its website www.hawaiielectriclight.com, or by calling 969-0137. Due to the recent lava flow activity adjacent to the Kaohe Homesteads area in the Puna district, the Department of Land and Natural Resources (DLNR) has closed all state unencumbered lands in the immediate vicinity. These include the parcels designated by Tax Map Key numbers: (3) 1-5-01:21, 26 and (3) 1-5-08:01. Signs have been posted at various access points warning the public of the hazardous conditions. DLNR has been receiving reports of tour groups and individuals wandering onto state lands to get a better look at the lava. Although the lava flow has temporarily stopped, there are outbreaks still entering onto state lands. To ensure safety, DLNR is closing this area to all but essential personnel. DLNR has also closed Wao Kele O Puna forest reserve, and Kahaualea Natural Area Reserve. Both areas are off-limits to all persons. Entry into closed lands is a violation of Hawaii Administrative Rule Sec. 13-221-4 and Hawaii Revised Statute 171-6, and is subject of penalty up to $5,000 for the first offense. The Governor’s proclamation enhances the penalties for any offense committed during this emergency. “DLNR intends to prosecute any trespassers who willfully violate the closures and place enforcement officers and emergency personnel at increased risk,” said William J. Aila,Jr., DLNR chairperson. The county Department of Parks and Recreation has closed its Pahoa Senior Center so the facility may be used as an emergency fire station servicing the lower Puna community threatened with lava inundation. Until the lava threat from Kilauea Volcano ends, the Hawaii County Nutrition Program and the Senior Club will operate from the Nanawale Community Center. Coordinated Services for the Elderly (CSE) and Elderly Recreation Services (ERS) have been relocated to the Keaau Senior Center. For more details regarding the Department of Parks and Recreation’s elderly services, please call CSE at 961-8777 or ERS at 966- 5801. The Department of Parks and Recreation apologizes for any inconvenience caused by the closure of the Pahoa Senior Center and thanks the public for its patience and understanding during this time of emergency. The American Lung Association in Hawaii warns visitors and people living near the lava flow in Puna to take precautions against smoke exposure from burning vegetation and low levels of sulfur dioxide. This smoke is a mixture of gases and fine particles released as vegetation burns. In addition to burning your eyes, these fine particles and gases can be inhaled deeply into your lungs, making it harder to breathe. Exposure can worsen other chronic health conditions such as asthma or heart disease. Exposure to sulfur dioxide, a gas emitted by volcanoes, can also be harmful, burning the nose and throat and causing breathing difficulties. Residents with respiratory problems such as asthma, chronic obstructive pulmonary disease (COPD), and also those with chronic heart disease should take extra precautions during this time and call their physician immediately if problems develop. Stay inside as much as possible, with doors and windows shut. Make sure only clean air circulates through air conditioners and/or air cleaners by using the recirculation setting. When driving through smoky areas, car windows and vents should be kept closed. Air conditioning should be set to “recirculate” to avoid exposure to unhealthy outside air. Avoid exercising outdoors, particularly if you smell smoke or experience eye or throat irritation. Individuals with asthma are encouraged to contact their physician regarding any changes in medication they may need to cope with smoky conditions. The American Lung Association advises asthma patients who cannot reach their doctor to continue to take their medication and closely follow their asthma action plan as prescribed. If you have questions, you can call the American Lung Association’s Lung HelpLine at 1-800-LUNG-USA (choose option #2) to speak to a lung health expert. HIHS encourages all pet owners to be safe and prepared. If you are advised to evacuate, please consider your pet’s safety. Do not leave animals behind. Develop a plan for their ongoing care including transportation arrangements. Larger animals including horses and livestock may need to be moved well in advance. Call friends or family members to locate alternate pastures. If you evacuate, arrive at your destination prepared with your pet’s emergency kit and take your pets! The mission of the Hawaii Island Humane Society is to promote respect for all animals, prevent cruelty to animals, eliminate pet overpopulation, and enhance the bond between humans and animals. HIHS holds a contract with the County of Hawaii to enforce certain animal-related laws and it offers 24-hour service for injured animals and other animal emergencies, humane education classes, low-cost spay and neuter services, lost and found assistance, micro-chipping and more. If you need help or advice with your emergency planning, call the HIHS Keaau Shelter at 966-5458. Call for volunteers: In the event of an evacuation, HIHS Keaau Shelter will contact volunteers for assistance. If you are able and willing to assist, call the Keaau Shelter at 966-5458 to add your name to the volunteer call list. Emergency Kit Wish List for HIHS Keaau Shelter: Donations graciously accepted. Hui Pono Holoholona offering temporary shelter to cats displaced by lava. Owners provide food, litter, medications. 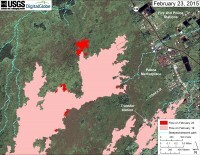 The June 27 lava flow poses a threat to farms and homes in the Puna area near Pahoa. Since this flow is in an agricultural area, it also threatens farm animals such as chickens, ducks, sheep, goats, horses, pigs, in addition to dogs and cats. All these animals would need to be evacuated in the event of an approaching lava flow. As people prepare for possible evacuation, they need to prepare and plan for evacuating their livestock and pets, too. Finding accommodations for displaced people and their animals could become a major challenge as this lava flow continues. H.E.L.P. Puna is providing a free website service for residents who need to find places to protect their animals, and other residents in safe areas who wish to offer their properties as “Places of Refuge”. H.E.L.P. is the Hawaii Evacuation of Livestock and Pets, a program of the Good Shepherd Foundation, a nonprofit organization with an animal sanctuary in Opihikao, not far from the lava flow. Everyone is invited to offer their property as a haven from the lava flow for any livestock and pets they can accommodate. Some will be willing to accept only certain types of animals, such as dogs or cats. Others may have large fenced pastures or yards where they can take horses, sheep, or goats. Still others may have small backyards where they can only take chickens. Those offering their places as refuges can do so for free or for a fee. It is between the parties to decide all financial issues and ensure there is a good fit. We also invite those with animal trailers to offer their services on this website. Some people will need help moving their animals. Tourism officials are reminding travelers the lava flow likely will not impact their vacations. Most of the island’s hotels and resorts located along the Kohala and Kona coasts – the opposite side of the island – and none have announced any changes to operations in response to the lava flow. However, Birch said, those with plans to stay at bed-and-breakfast or vacation rental units in the near future should keep in contact with the owners for the latest updates. Guests who may not be able to stay in those units are urged to contact the BIVB office so accommodations can be made.